For at least fifty years economists have argued that vertically-aggregated marginal willingness to pay, when set equal to marginal provision cost, will result in optimal public good provision levels. This methodological approach would be expected to yield an exact analog, in terms of optimal levels of public good provision, to efficient provision of private goods in a perfect market setting. There is, however, a potentially serious flaw in the approach as actually practiced, since initial incomes are implicitly–and wrongly–taken to be optimal. From a given income, the output demand revelation problem has long been recognized–that there will be difficulty inferring true demands for public goods at that income (the traditional `free rider' problem). But what has failed to receive widespread recognition among theoreticians, and especially among practitioners, is that there will also be a concomitant `input demand revelation' problem. In any situation where workers cannot individually increment a class of goods by increasing their income (e.g. public goods), they will have no incentive to generate the income that would have been devoted to that class of goods. They will only generate income that is optimal to pay the higher taxes or prices associated with whatever initial public goods levels are provided. As a consequence, the benefit-cost practitioner will, even if somehow able to accurately guess marginal willingness-to-pay out of current income, observe only one apparent optima. There are an infinite number of such optima, one for each level of free riding in input markets, where aggregated marginal willingness-to-pay will appear to equal marginal provision cost. The one true Samuelson `optimum optimorum' occurs when there is free riding in neither output nor input markets (that is, when the `full' demand revelation problem is solved). 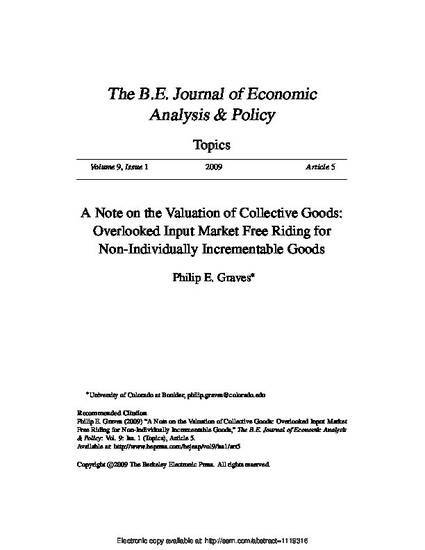 As a consequence, pure public goods, as well as other `non-incrementable' goods and goods for which non-use values are of importance will be undervalued, hence under-provided. Evidence is presented that the problem raised here might be of importance, undermining the practical significance of the Coase theorem vis-à-vis Pigouvian taxation.